If you're looking for some of the creepiest deep sea creatures on the planet, look no further than the Mariana Trench, located in the Pacific Ocean directly east of the Philippines. Neither these scary-looking sea monsters nor the trench itself — largely considered one of the creepiest places in the ocean — are for the faint of heart. The deepest part of any of Earth's oceans, the Mariana Trench is five times longer than the Grand Canyon and would be 7,000 feet deeper than Mount Everest if the peak was submerged there. There is no sunlight at 3,280 feet below the surface; the pressure at the bottom is 1,000 times greater than at sea level; and the temperature hovers just above freezing. Any living animals swimming in its murky depths require specialized adaptations, such as bioluminescence — AKA the ability to glow in the dark — or glowing photophores, bodily organs that emit light, to survive. The creatures that live in the Mariana Trench have adapted, but they've adopted terrifying appearances in exchange. 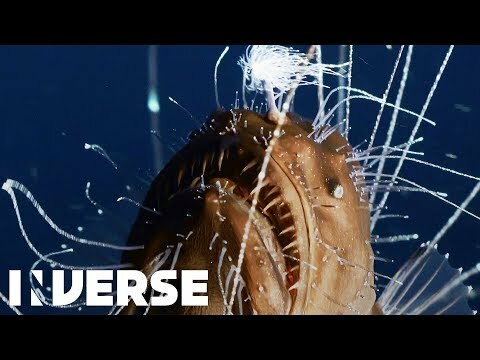 Scientists and filmmakers continue to study the largely unexplored area, but who are these creepy Mariana Trench creatures, and what makes them special? Fanfin seadevils are a type of angler fish, and they have a bioluminescent lure used in attracting prey as well as in avoiding becoming prey itself. The hairy-looking spikes on its body are sensors that help the fish balance as well as check the water for surrounding entities and prey, not unlike a cat's whiskers. Fanfin seadevils may be some of the scariest creatures you've ever seen, but at least they're tiny. Females are about six to eight inches long while males are even smaller, measuring only about a half inch in length. The males are known as "sexual parasites," and during the mating process, they latch onto the female and essentially fuse themselves permanently onto her body in order to reproduce. Zombie worms, also called osedax, are not your typical zombies. Instead of brains, these creepy creatures eat the bones of whales and other fish. But because they don't actually have mouths, zombie worms secrete acid to dissolve the bone and bacteria. Then, the worm digests the protein and fat. Incidentally, the females are the bone-eaters while the males live inside the females. They certainly make human zombies sound a lot more normal. Hatchetfish get their name from the shape of their bodies, which are extremely thin and blade-like. They have large eyes that are sensitive to light and point upward, allowing them to see food coming from above. These unusual fish also possess glowing photophores along their sides and bellies (like a firefly), allowing them to hide in the ocean depths by countering the light coming from above. This makes them nearly invisible to both predators and prey in the ocean's depths. Dumbo octopuses look like characters straight out of a Disney movie. In fact, they got their name from the Disney elephant with similar long, floppy ears. On the octopus, these floppy "ears" are actually fins, but, like Dumbo's, they are used to fly — in this case, through the water. The Dumbo octopus has a semi-translucent body and a squat shape, growing up to 12 inches long. Of all octopus species, they are the deepest living, some inhabit the depths as low as 23,000 feet.